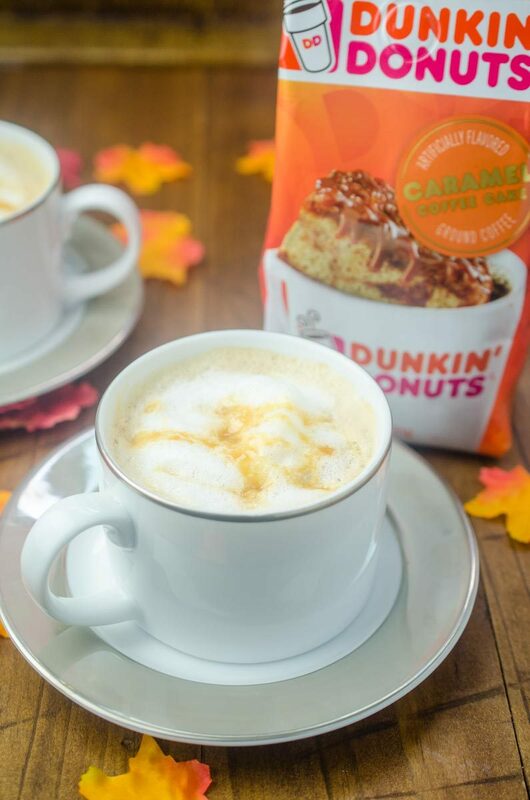 With only 6 ingredients, this Caramel Coffee Cake Latte is easy to make at home. 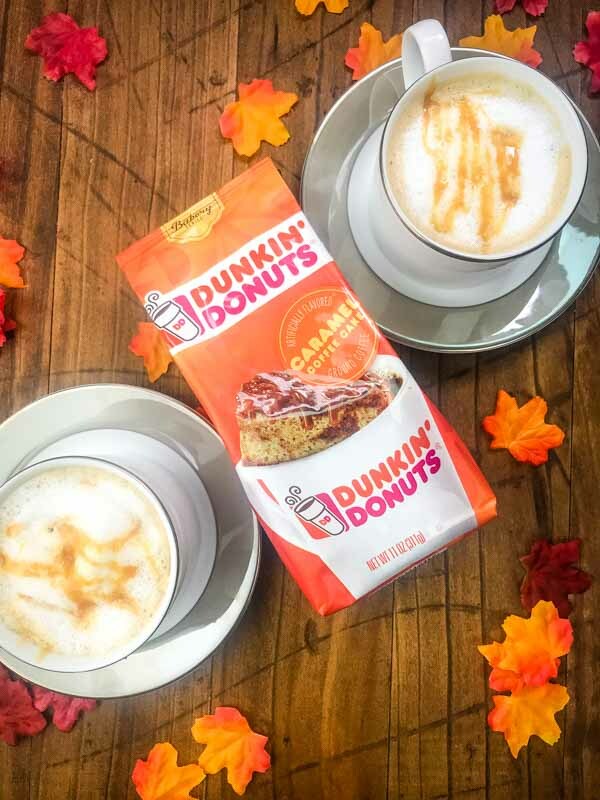 And it is the perfect afternoon pick me up on a cool fall day. This post is sponsored by the © The J.M. Smucker Company. All opinions are my own. We are grateful for our sponsors as they allow us to bring you delicious free content every week. You guys, it’s here! It’s here! Fall is here!! Can you tell I am excited? Fall is my favorite season. It has always been my favorite season. I love the cool crisp air. The vibrant orange and yellow leaves against the bright blue skies. I love all the holidays. I love football. And honestly, I also love the rain. That is probably directly related to growing up in the Pacific Northwest. And when it’s raining, as it so often does here in Seattle, I love cuddling up on the couch with a good book and a hot decadent coffee drink. 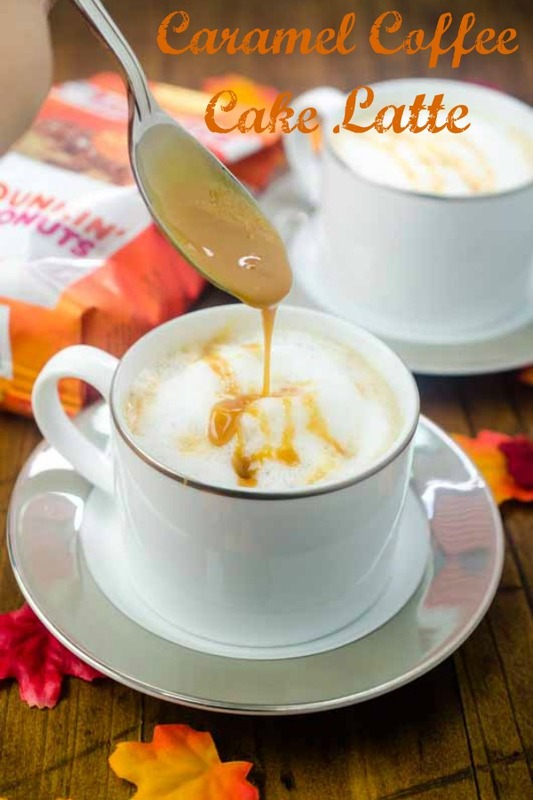 Decadent hot coffee drinks like this Caramel Coffee Cake Latte. 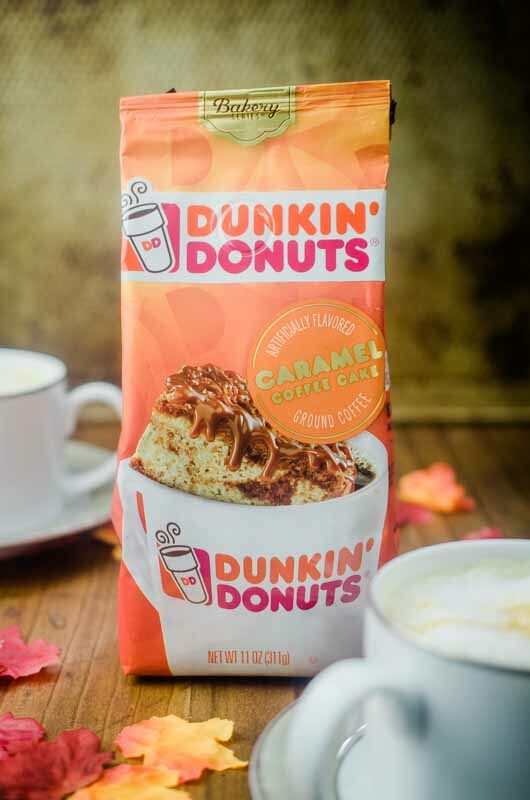 The Caramel Coffee Cake flavor comes from Dunkin Donuts Caramel Coffee Cake Coffee. One whiff of this coffee brewing and I couldn’t wait to try it. My whole kitchen smelled like sweet coffee cake. And as good as the coffee is on its own, it’s even better in a latte. Some of you may be like, ok Des, I don’t have a fancy espresso machine at home. I’m not an expert, how do I make a latte at home? But guess what you don’t need one. Simply brew a strong batch of your favorite Dunkin’ Donuts coffee, use a simple trick to make your own milk foam and voila you’ve got yourself DIY latte. The key to a latte is the milk foam. It’s my favorite part. And if you have an espresso machine you can do it with the frother. But all you need is a mason jar to do it yourself. Simply shake the milk until frothy and microwave it. While heating the foam will separate from the milk. You can then pour the steamed milk into the coffee and spoon the milk foam over the top. 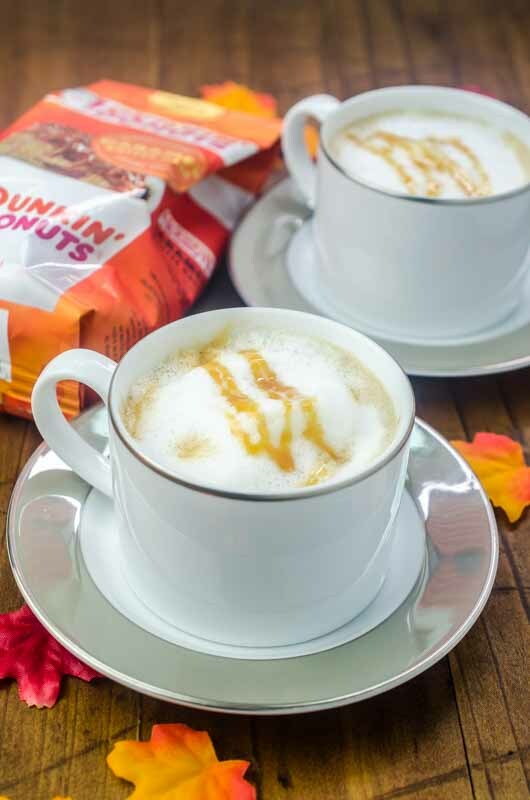 So as the days get shorter, the gets air cooler and there are some rainy afternoons, take just a few minutes of your afternoon to treat yourself to this Caramel Coffee Cake Latte. Pour milk into a small jar with a lid. Shake for 45 - 60 seconds or until milk is frothy and has doubled in volume. Remove lid and microwave for 30 seconds. Pour coffee into coffee cup. Use a spoon to hold back the foam and pour desired amount of milk into cup. Stir in 1 teaspoon vanilla simple syrup. Spoon milk foam onto the top. Drizzle with caramel sauce. Serve immediately. 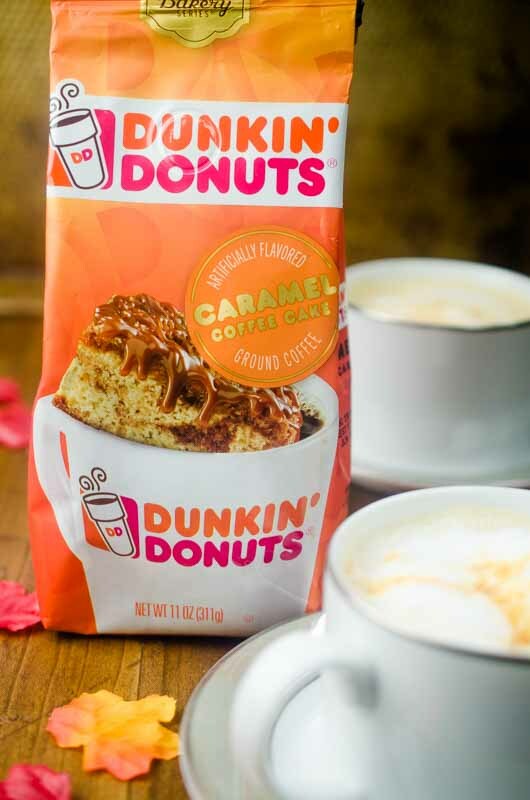 That looks like dessert in a cup…so inviting! I could go for one or two of these right now. It looks amazingly delicious! Oh my goodness. All I can think about is this. Will have to make one of these tomorrow morning. I need to give this a try ASAP!!! YUM!! This is the perfect way to start off all my mornings! This is how I need to start every . morning! I cannot wait to try it out! I would love one of these in the morning or the afternoon! So easy and a delicious flavor! Mmmm, this is so perfect for Autumn! Oh this looks so amazing !! I need to make this! !